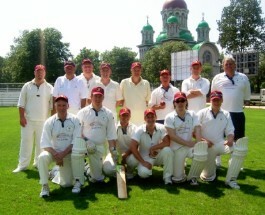 Most cricket club tours are based in England. A few are more ambitious and seek to sample the hopitality in the West Indies or Australia. Either way, the accent is on fun; on Bacchus rather than back-foot defence. A few social games are played, rather more than a few drinks are consumed and the very happy tourists return home poorer, but with a fund of stories to last the winter. Southport and District League side New Victoria prefer the more unusual expeditions: on Saturday the club begins its three-game tour of Romania and Bulgaria. That afternoon the intrepid cricketers will fufil their league fixtures against Hesketh Bank or Halsall/West End; then they aim to enjoy pie and chips at the Shrimper in Marshside: then it's off to Bucharest via Heathrow. This is no ordinary tour. In fact, it is New Vic's second trip to Eastern Europe. Last year, the club spent nearly a week in Bulgaria where the welcome they received was so warm that they decided to tour the country again in 2008. "They were so appreciative of what we did," said club chairman Peter Hames. "The Rector of the National Sports Academy came and said thank you, and one night the Minister of Sport turned up to thank us." The gratitude of the Bulgarians was not confined to government officials. New Victoria's decision to tour a country where cricket is in its infancy, and to donate a huge quantity of equipment to the clubs they played prompted a reaction from the local players which will stay with New Vic officials for as long as they remain involved with the game. "They'd only got a few cricket balls in the country," said Hames. "So when we opened our bags and there were 200 cricket balls rolling around, it was like Christmas morning for them. There were grown men saying, 'Look what we've got.' It'll be nice to see how the game's developed in the past year." For the indefatigable tour organiser Owen Jamieson, a man whose commitment to Eastern European cricket has led to him representing Poland in the European Twenty20 tournament currently taking place at Carmel in North Wales, the missionary aspect of the tour is vital. "It's not about playing cricket in weird places" he insisted. "It's about taking cricket to a place where they have hardly played the game, where it's just starting off." This aspect of the tour was emphasised last summer when the Southport tourists were asked to spend one morning giving a game of Kwik Cricket to 30 local children. They agreed of course. For some Bulgarian residents, though, cricket was not a game which needed to be taught. The news that New Vic were in town led to a match against the British Embassy including the then ambassador, Jeremy Hill. Indeed, there were dark mutterings at the meeting to organise the 2008 tour that Jamieson's respect for our man in Sofia had prevented New Vic's wicketkeeper from stumping him. This year New Vic have accepted a request to tour Romania and will take on the Transylvanian Terriers in a rugby stadium which can accommodate 40,000 spectators. The game against the Southport team may not be a sell-out but no one is taking any bets. And at the end of it all there should be both warm memories of a lot of fun - the film of the 2007 expedition begins with Mambo No 5, the music from Channel 4's cricket coverage, but ends with the theme from the Benny Hill Show - and, crucially, a colossal sense of achievement. "I have this dream that when I'm about 65, Bulgaria will be playing in the early stages of cricket's World Cup," said Hames. "And I'll be able to say that New Vic helped them to get started."